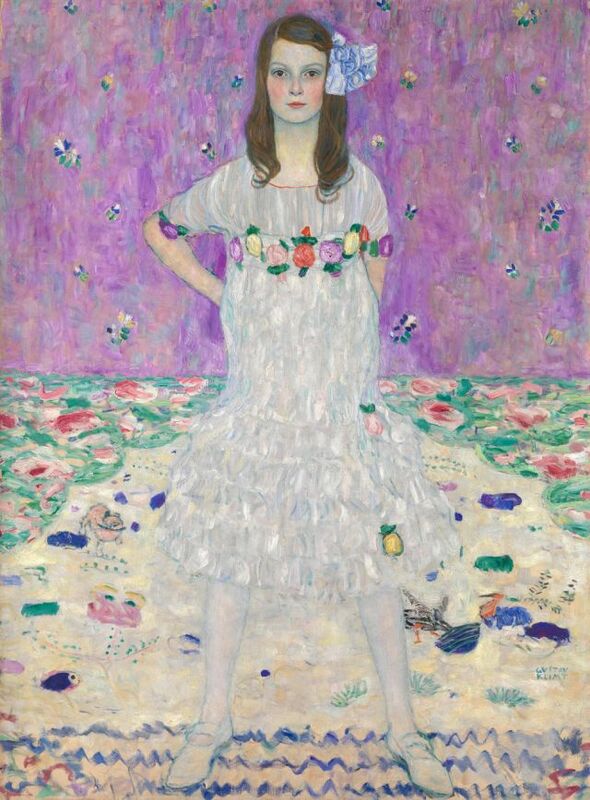 In 1912, Austrian artist Gustav Klimt painted a portrait of a 9-year-old girl. Her name was Mäda Primavesi. Born in 1903, she was the daughter of Eugenia and Otto Primavesi, the latter a banker and glass manufacturer from Olmütz, in what is now the Czech Republic. Both the mother and father were known for hosting decadent salon-like gatherings at their country home and supporting the community of artists and architects called the Wiener Werkstätte. So they were cozy with the likes of Klimt and his contemporaries. Otto commissioned the seven-foot portrait, a painting that would go down in history, according to the Getty Museum, as Klimt’s only major work featuring a child. To prepare, Klimt created numerous studies of the late Mäda perched atop a chair or leaning forward impishly. The pose that made it to the final frame involves the girl staring directly at the artist, her legs sternly parted and her arms stationed defiantly behind her back. She appears not unlike Klimt’s adult female subjects ― if anything, she seems more confident. And perhaps she was. That portrait is currently on view at New York City’s Neue Galerie, in an exhibition titled “Klimt and the Women of Vienna’s Golden Age, 1900–1918.” The show features portraits of various named and unnamed women we don’t often hear about in history classes, from Adele Bloch-Bauer to Gertha Loewe to little Mäda. She stands out amongst the array of mature women, both for her age and her surprisingly brazen gaze. In a 1987 interview with The New York Times, Mäda ― more properly, Gertrude ― recalled her time spent with the great Klimt, known for his gilded masterpieces like “The Kiss.” She explained that her family would travel to Vienna, Austria, every few months, for stays of around 10 days. Over the course of her sessions with Klimt, she estimates that he made approximately 200 sketches of her. The Primavesi family sold her portrait in the early 1930s and it eventually ended up at the Met by 1964. Back in 1914, Klimt had also painted Mäda’s mother Eugenia, a former actress. That portrait was thought to have been lost amidst the chaos of World War I, until Mäda put the painting up for auction in 1987. (It is now housed at the Toyota Museum Japan.) At that time, Mäda ― who died in 2000 ― was the last living subject of one of Klimt’s works. Today, the image of a 9-year-old Mäda persists. While it’s easy to peer at her portrait and never wonder about the bold child staring back at you, it’s heartwarming to know that the hands-on-her-hips preteen was just as captivating in real life as she seems on canvas.